You are so incredibly generous! 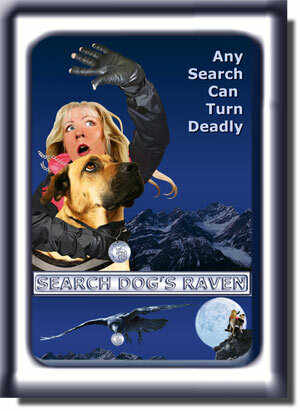 Though all the information is factual, DogsRaven.net is the fictional web site for the upcoming film 'SEARCH DOG'S RAVEN' (SearchDogsRaven.com). The new action thriller tells the eerie story of a wilderness search dog team. Click on the poster for more information. Like a film within a film, the upcoming animated adventure 'Search Dog's Raven', the real life adventures of a search dog team is part of the film's story line AND a real spinoff of the film 'SEARCH DOG'S RAVEN'. Click on the coin below for more information. IF YOU ARE STILL FEELING GENEROUS, please consider donating to a local search dog unit or local Humane Society.